Jimbo has always been a musician that has followed his own muse rather than musical fashion, as evidenced by his being a founder member of the blues, jazz, klezmer and goodness knows how many other genres, the Squirrel Nut Zippers. Since starting his solo career he has made albums full of hard hitting blues, some with a psychedelic edge, and some of it blues rock, as well as rural delta blues that sometimes contains a blend of ‘hillbilly’ and ‘race music,’ southern rock and even twangy country, often incorporating all of the various styles on the same album. He doesn’t stop there with keeping the listener off balance either. Even his Christian name is subject to change, having been Jim, James, Jas and now just for good measure Jimbo. Whilst his musical philosophy of never standing still should be hugely admired, as a fan, I can’t say I’ve loved everything he has done and suspect he would neither want me to, nor care one way or the other, so long as he can remain true to his highly individual and at times idiosyncratic take on roots music. He will never have the style that fits into the mainstream and as with most of his fans, I wouldn’t want him to. I love his raw expressive vocals that are a million miles from chart music, allied to a pretty much unique style of writing and blending of these various generic offshoots. Not for him the well trodden path of commercialism, although I doubt he would object to making a fortune, but he is too much his own man when it comes to the music he makes to ever be dictated to. This album probably fits best into the ‘classic country rock’ category but not the twee branch that was so prevalent in the 1970s. In fact there is some common ground with early failures in toeing the line, the Flying Burrito Brothers and Gram Parsons, in producing an original blend of excellent music that tips its hat to so many genres. Also included is a little blues rock, some eerie old sounding blues with a gospel sensibility, some southern rock, ……….. oh, I’m sure you get the picture! His tremendous band, the Tri-State Coalition is made up of Matt Pierce on guitar, Eric Carlton, keyboards, Terence Bishop, bass, Ryan Rogers on drums and multi instrumentalist Jimbo handles vocals amongst other things. allows the album to become disjointed or the flow upset. on this new album that probably contains more country, or certainly country rock than any of his previous albums. Could this be a new direction for Jimbo? If you think that, you obviously haven’t been following the career of this boundary stretching musician. 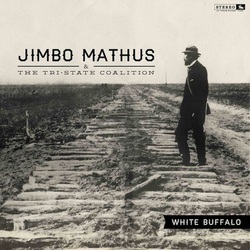 Long may he continue on those diverse pathways that have converged to form an excellent album that should appeal to all true lovers of roots music, whichever of those sub genres has most appeal.